An overview by Metal Earth PhD candidate, Eric Roots. The Metal Earth magnetotelluric (MT) survey was carried out by Complete MT Solutions beginning early June and ending in late September 2018 sucessfully collecting data at 750 stations along the 13 Metal Earth transects. 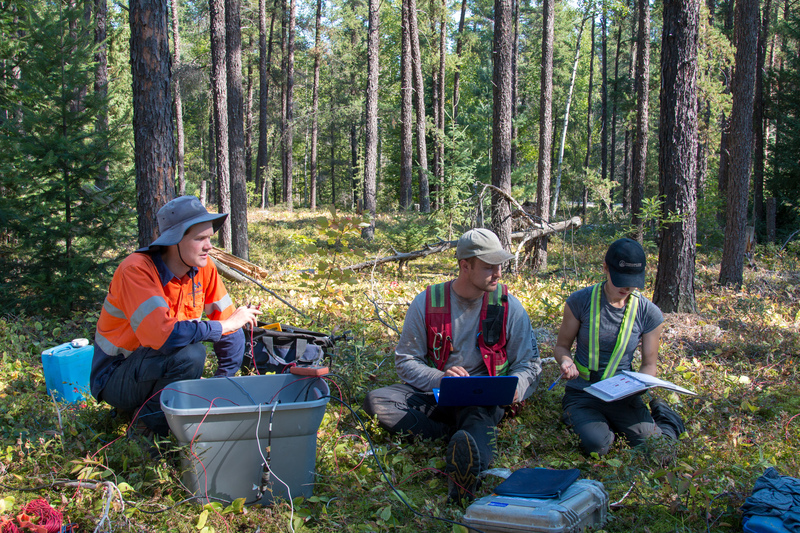 The MT data will be used conjunction with the other geological and geophysical datasets collected through Metal Earth to give a better understanding of the deeper structure of the Superior province. The resistivity models resulting from inversion of the data will also allow investigation of key differences in lithospheric structure that result in the disparate levels of metal endowment seen between the western and eastern regions of the Superior province. The data will also be used to develop and test a new inversion methodology which will allow geological and geophysical observations regarding the underlying stratigraphy to be included directly into the inversion process. Data was collected at 750 stations along the 13 Metal Earth transects. These are, from west to east: Rainy River, Dryden, Atikokan, Sturgeon Lakes, Geraldton, Swayze, Matheson, Sudbury, Larder Lake, Cobalt, Rouyn-Noranda, Amos-Malartic, and Chibougamau. The stations are largely coincident with the seismic lines surveyed in the summer of 2017. As with the seismic survey, the MT data were collected along broad-scale R1 lines, which have a BBMT station spacing of ~5 km, and high-resolution R2 lines with alternating AMT and BBMT stations with a spacing of 330-500 m. Transects are up to 130 km in length, totalling over 900 line km. Combined with legacy data available through previous Geological Survey of Canada projects, the dataset has a total coverage of ~4000 km2. The combination of R1 and R2 lines allows for investigation of the resistivity structure of the upper to lower crust, as well as potentially the upper-most regions of the mantle. This will facilitate identification of crustal pathways for the migration of fluids from depth as well as the deeper structure and processes associated with mineralization. A combination of audio-magnetotelluric (AMT) and broadband (BBMT) data were collected. The AMT data covers the frequency band between ~10000-1 Hz and provides information on the structure of the upper-most crust (to depths of ~2 km), while BBMT covers the frequency band between ~320-0.0001 Hz which allows imaging of depths up to 50 km under favourable conditions. The first steps in developing a robust model of the data set are to assess the quality of the data and eliminate any measurements that are of poor quality. The resultant high quality data set is then ready for modelling and interpretation. Initial analysis of the dimensionality shows a 3-D structure and as such a 3-D approach is being utilised. Transect scale 3-D modelling to identify large scale and deeper structure unique to the each transect is followed by modelling of the higher resolution segments to produce detailed models of the resistivity structure along these areas where important geologic structure is expected. Image: Dylan Coles (left), Connor Sands (middle) and Brittany Gélinas (right) from Complete MT Solutions.